Cologne Cathedral stands apparently untouched, but actually serverely damaged. It was hit by many bombs. The entire area surrounding it is completely devastated. Railroad station and Hohenzollern Bridge lie damaged to the north and east of the cathedral. Cologne endured exactly 262 air raids by the Western Allies, which caused approximately 20,000 civilian casualties and completely wiped out the centre of the city. 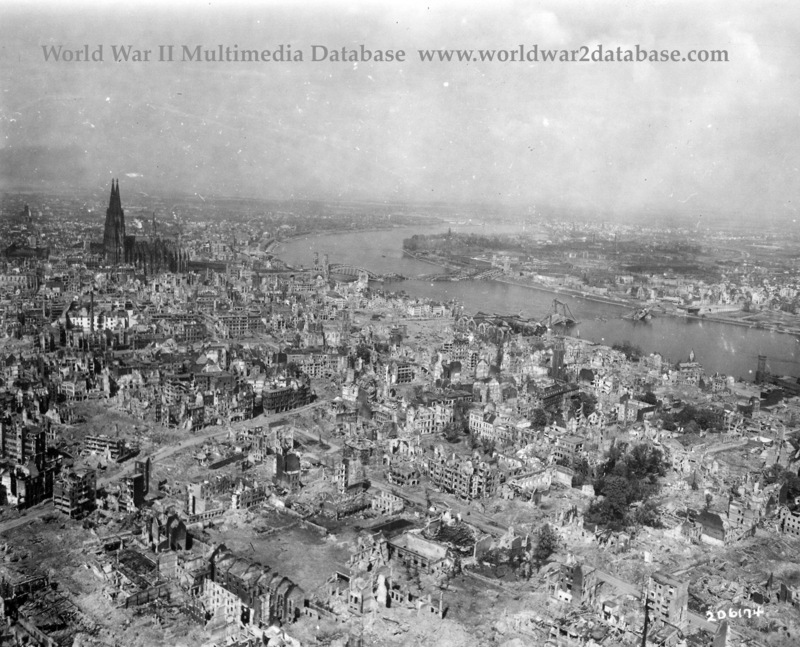 During the night of May 31, 1942, Cologne was the site of "Operation Millennium", the first 1,000 bomber raid by the Royal Air Force in World War II. 1,046 heavy bombers attacked their target with 1,455 tons of explosive. This raid lasted about 75 minutes, destroyed 600 acres of built-up area, killed 486 civilians and made 59,000 people homeless. By the end of the war, the population of Cologne was reduced by 95%. This loss was mainly caused by a massive evacuation of the people to more rural areas. The same happened in many other German cities in the last two years of war. At the end of 1945, the population had already risen to about 500,000 again.